Gov. 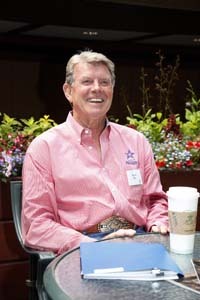 Butch Otter will bring Boise to Sun Valley next Wednesday in an attempt to reach out to the community while celebrating Sun Valley Resort's 75th anniversary. Otter announced early this month that he will bring the state's "Capital for a Day" program to Sun Valley on Dec. 21. The program is a chance for Otter to bring state government to Idahoans living outside of Boise each month, providing local residents an all-day opportunity to have open discussions about government issues with Otter, members of his cabinet and other senior state officials. "It's a no-holds-barred give-and-take between citizens and state officials," said Jon Hanian, the governor's spokesman. "The itinerary is pretty much the same everywhere. They usually go around the room and do introductions, the governor introduces his cabinet and the other state officials, they talk about what is going on in that particular area and then the governor opens it up for questions." The program is set to begin at 9 a.m. Wednesday in the Continental Room at the Sun Valley Inn. Local author Van Gordon Sauter will present Otter with a signed copy of his latest book, "The Sun Valley Story," in commemoration of the resort's anniversary. Rep. Wendy Jaquet, D-Ketchum, said Sun Valley Marketing Alliance President Arlene Schieven will give a presentation to the governor of the series of video vignettes created earlier this year to promote Sun Valley. The vignettes feature locals and their stories and have been shown to theatergoers in Boise, Seattle and Los Angeles since last month. In addition to the marketing presentation, Sustain Blaine Executive Director Harry Griffith will be on hand for a presentation of the economic impacts of Friedman Memorial Airport, while airport Manager Rick Baird and members of the Fly Sun Valley Alliance will talk about the importance of retaining commercial air service to Sun Valley. According to Jaquet, Denise Simon from the Company of Fools theater group will speak with the governor on the importance of art and culture to the community. "Most of what is happening in the morning is pretty well scheduled," Jaquet said, but after a break for lunch, the governor and his entourage will be available until 3 p.m. for questions from the public. "The idea is, he's bringing his 15 agency heads, and basically people talk about what's happening in the community and he sees if any agency heads can help," she said. Accompanying Otter are first lady Lori Otter, Lt. Gov. Brad Little, Secretary of State Ben Ysursa, state schools Superintendent Tom Luna, Department of Fish and Game Deputy Director Jim Unsworth and representatives from the Department of Health and Welfare, the Transportation Department, the Lottery and the Liquor Division, the Idaho Commission on the Arts and College of Southern Idaho. Jaquet said she's most excited about one particular event, and it does not include the agency heads. "The big thing is, [Otter's] going to ride the bus!" she said. The governor will catch the 3:40 p.m. bus from the Sun Valley Lodge bus turnaround, on the suggestion of Jaquet, who urged the governor to see the busses that received state funding. Mountain Rides head Jason Miller will also be in attendance. The event is free and open to the public, with the exception of the noon lunch. The lunch is mostly underwritten by Sun Valley Resort, but costs $10 per person. The governor will be available for a short time after the event to answer one-on-one questions.